☼ Motor speed: low-grade 7V/0.25A/3800 rpm,High grade 9V/0.36A/4800 rpm. ☼ Bear shape fan, folding design, easy for carrying. ☼ 2 speeds are adjustable, practical to use. ☼ Designed with a piece of mini mirror, convenient to makeup. ☼ Built-in rechargeable 1200mAh Li-ion battery, sufficient power. ☼ Charge it by connecting attached USB cable with your computer, charger or power bank, etc. ☼ Humanized handheld design, mini and portable, suitable for indoor or outdoor use. ♥ For your convenience, please search "MeiLiio + product name" to take the fastest way to buy other products you want and have a clear view of other products we offer in store. 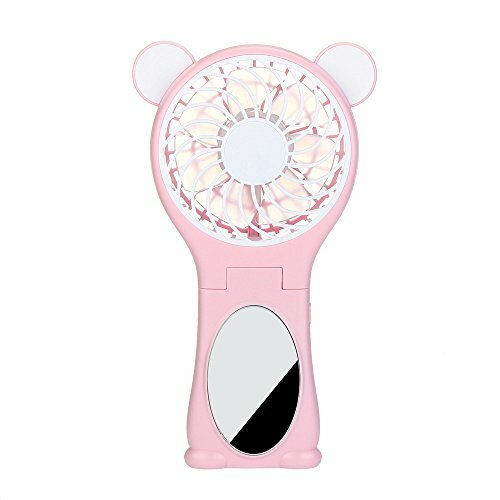 ☼ Designed with a piece of mini mirror, convenient to makeup,Humanized handheld design, mini and portable, suitable for indoor or outdoor use. If you have any questions about this product by MeiLiio, contact us by completing and submitting the form below. If you are looking for a specif part number, please include it with your message.